For the next meeting we are starting Episode 11 which takes place in the Ormond Hotel where Bloom has repaired for lunch. This is the Sirens episode. In The Odyssey, the Sirens lure passing sailors by their singing. 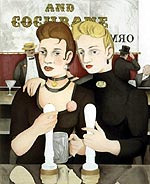 The Joyce version has many references to music, as well as two blonde barmaids.